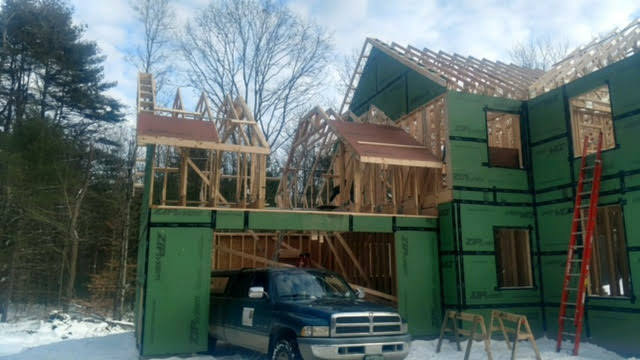 We have a new home under construction in Greenfield Center, NY featuring innovative and durable design and materials. Our clients asked us to keep in mind their growing family and changing needs while designing their home. We also focused on the long term cost of a home, to include operating costs (energy consumption, maintenance, etc.). With the new 2017 New York State Energy Codes, it becomes more important than ever that new homes be constructed with designs and materials that provide upfront cost effectiveness while providing long-term energy efficiency and durability. Underslab Preparation. This includes ample drainage stone and underslab drainage to insure a dry, usable basement. 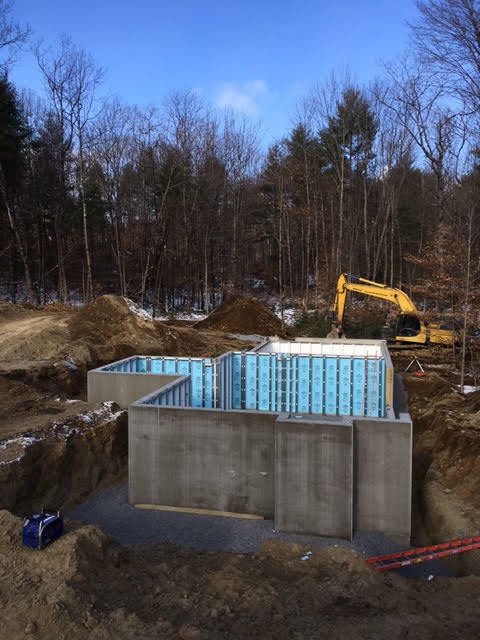 Underslab plumbing is provided to allow for a future family room bathroom as an inexpensive addition that allows for a significant upgrade in the future. Walkout Design. Using the existing slope on the site, we created an area of the basement with access to grade, making a great space for a future lower level family room or game room. This subtle change adds little cost but greatly increases the flexibility of the floor plan. Superior Walls Basement System. 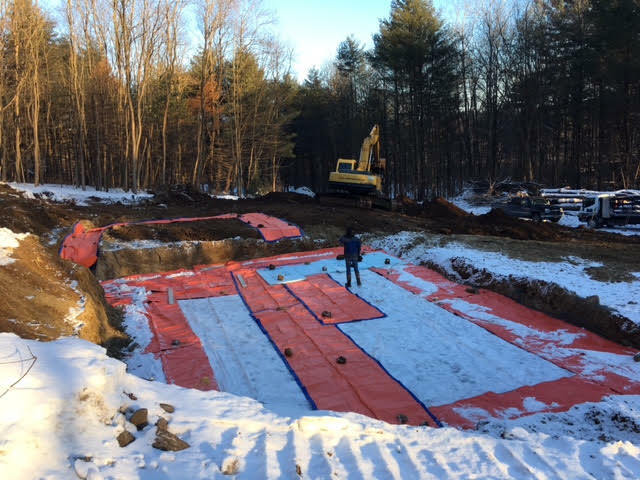 This basement system, which is prefabricated and includes up to R-28 insulation, is ready for wiring and completion for a finished basement. 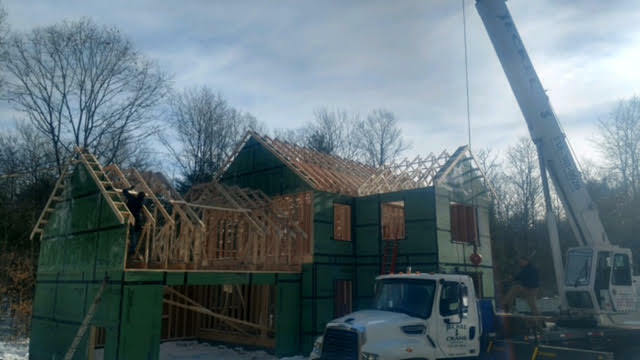 This greatly improves the comfort and efficiency of the home now and eliminates the need for future framing and insulation when they are ready to finish the basement. Advantech Floor Sheathing. This product remains stable and durable throughout the construction process. As you know, during construction homes can be exposed to rain, snow, and mud. Advantech flooring does not absorb water, creating a level surface for the finished floor. ZIP Brand Wall and Roof Sheathing. The Zip system is factory sealed against the elements. The ZIP Seam Tape seals against air and moisture infiltration and eliminates the need for house wrap. The ZIP sheathing itself resists the absorption of water so it stays stable and strong throughout the construction process, and through the life of the house. Roofing. Full depth roof framing and raised heal energy roof trusses allow for full-depth insulation in the attic over the wall plates. “Life Time” Roofing. Quality Owen’s Corning Roofing materials result in a roof that will look great and last a lifetime, reducing long-term maintenance costs. Energy Star Windows. Installing Pella Energy Star (Northeast) windows greatly increase the future efficiency and appeal of this home. Bonus Room Over Garage. Since the garage already has a foundation and wall system, adding an “attic” or “bonus room” over the garage creates a large area for a future fourth bedroom or bonus room. At Mansfield Custom Homes, we consider the above features to be standard in all of our designs and construction. However, not all builders make efficency and durability a priority. As you plan your new home, be sure to look into the imbedded quality of construction. It will pay off in reduced energy and maintenance costs over the life of the home.